Things Are Just Warmin’ Up! Stick around after for everyone’s fave emo night: Homesick! 2) It’s baaaack. 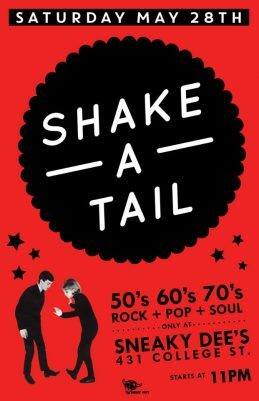 Shake-A-Tail returns this Saturday, May 28th with the best hip shakin’ 50’s, 60’s and 70’s! This one is going down in the books. See you at 11PM! AND of course we have our weekly staples, Legends Of Karaoke on Monday, and Another Round Trivia + What’s Poppin‘ on Wednesdays! Had enough? There’s more. 3) Presenting ‘Lemonade Views’ on June 4th! It’s the ultimate showdown. A night dedicated to the 2 biggest album releases of this year! Who’s side will you pick? Be sure to grab and advanced ticket here or in the words of Drake, it’s too late.